Hi Stampers and welcome to the Sparkle N Sprinkle blog hop, you should have come to my blog from Julie Warner ...I'm so excited about this hop because it features the men in our life, and if you are like me you sometimes struggle with how to make those cards, so hopefully you got a lot of inspiration to get creating those masculine cards! For mine I chose to use Victory, one of our four motorcycle images. I used Japanese Lacquer Embossing Powder, which is my pick that has been added to the Grand Prize package!! This is a tri fold card and opens both ways. The red base layer is cut to 4 1/2 x 9 and scored at 3 1/2 and opens to the right and the black smaller card is 3 1/2 x 9 3/4 and scored at 4 1/4 and opens to the left. The image panel is a new technique I've been playing with, I started by inking the Cuttlebug embossing folder Diamond Plate with Versamark on the inside cover, then lay the cardstock inside and run it through the machine. When you take it out cover the cardstock side with the Versamark with the Japanese Lacquer embossing powder and heat, then with orange and yellow dye inks and a dauber rub the white cardstock to color it. Then I cut it down to 3 x 4 (I actually got 2 pieces of this so I can make another card!) For the main image panel I stamped the motorcycle with Versamark and embossed with Japanese Laquer and used the Sand image for pebbles on the ground with a light grey ink, then I cut it out with Spellbinders Labels 2 die and sponged the edges with a gray before I took off the dye. I used a marker to color the flame on the bike. The sentiment is also embossed and adhered with dimensional tape. The map background was printed on the computer. For the inside I embossed the sentiment from the Motorcycles stamp set again and used the Tire Tread in black ink. Hope you have found some inspiration in all these cards....you are at the end of the designers for the blog hop so after you leave a comment here hop back to the beginning at the Sparkle N Sprinkle Blog and leave one last comment and let us know what you liked.....GOOD LUCK!! What great use of masculine elements with a flamin' look! Often, special folds are not used in masculine cards. Jill, what a fantastic idea, and wonderful card! Great card. I love the tri-fold. Great techniques Jill. Trifold always creates more interest as well. Love it! 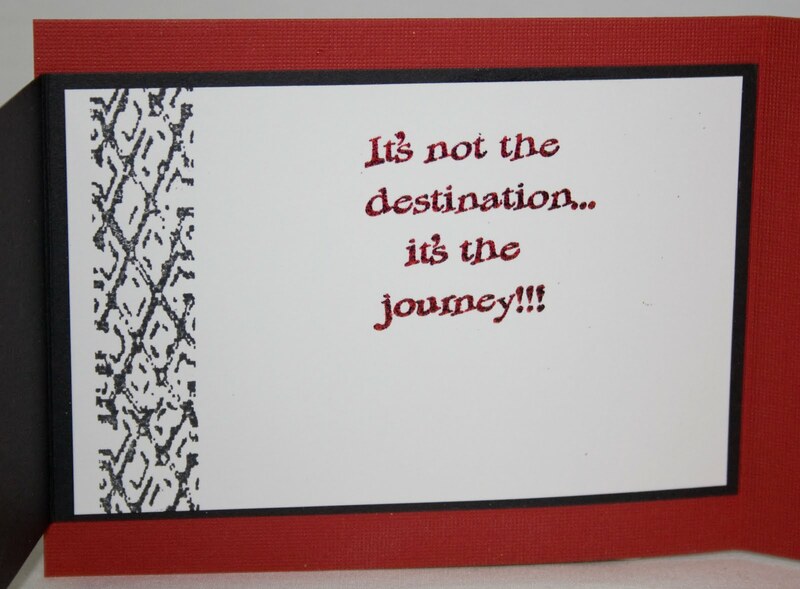 Love the fold of your card and all that embossing~! Great work! Love the embossing. 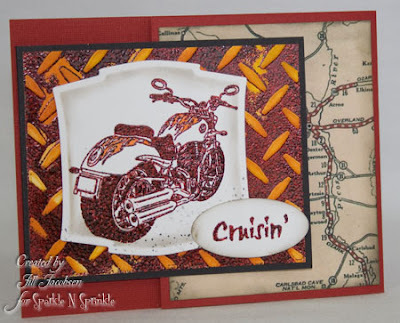 The motorcycle cards are my favorites in this blog hop. Great card, Jill. I love what you did with the motorcycle! Great card Jill. Your eye for design is simply perfect!!! Love your motorbike cards Jill. I am sure loving that tri-fold card...that is a fantastic technique. Your card is fabtabulous!!!! I guess they saved the best for last cause this is the best! Love the map idea with the tire tread. Very cool idea. Love the map and the textured background! Terrific, Jill! Love the colors and map bg. Perfect texture and coloring for a guy card. Great job! I love your masculine cards. Great design elements and very sporty looking images you chose. My men would like that! Awesome card. I too love the map as the background. This card is fabulous ... not only does it fit the macho masculine but what a wonderful card for a retirement! Love the sentiment! Thanks for sharing. Jill, Such fabulous techniques you have used! Love that motorcycle and the way you used the Japanese Lacquer EP on the background. That happens to be one of my favorite EPs but I don't think I've ever thought to use it on a masculine card. Such great inspiration from every one of the DT on this hop! Thanks so much. Simply stated yet most definitely very well done!! 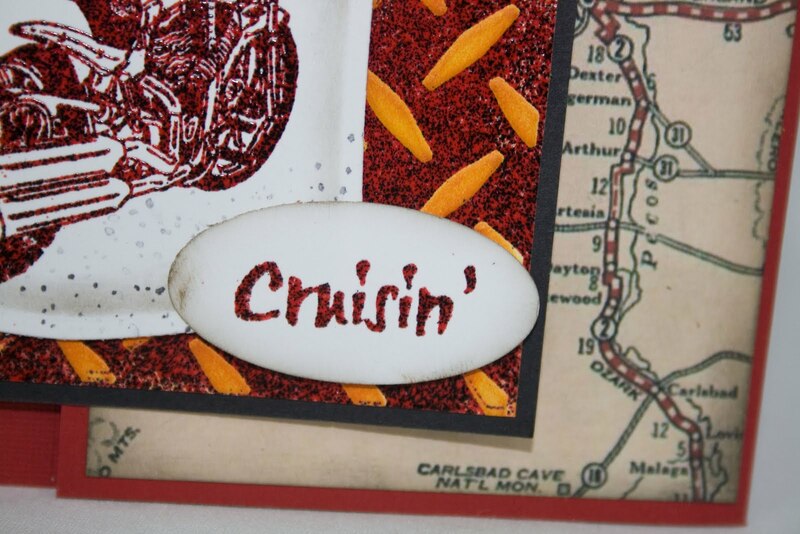 Your card encourages one to jump on and start "crusin'"! Liked the tire tread on the inside of the card. Neat card! The tire tread is amazing. What a neat technique. Gotta try that one! Jill, I love what you've done with your new technique! Keep on playing because you come up with some great new techniques. Great card! I love what you did with the diamond-plate background! Very cool! That new technique came out quite well. I really like that Japanese lacquer embossing powder. Jill I just LOVE,LOVE,LOVE the background. The colors are fantastic. The way the card folds is great. Super card! The background technique sounds very interesting. I love the way you created the card using a tri fold to create the different dimensions. The inside is just perfect. Such amazing work on your card! The embossed tire tread is so cool and I appreciate your sharing the technique with us! Very, very imaginative. Loved your card. Very masculine and so timely. What a great tri-fold card with the perfect backgrounds and textures! Thank you for cruisin' in this hop and inspiring us! Love that trifold! Thanks for the inspiration! Great sentiment and love the script on the "cruisin'" and the map background. Love your card Jill, especially the embossed background! Very macho! What a pretty card! I love the colors of the motorcycle you are pulling from the background. Beautiful job! Like the motorcycle and techniques. Great masculine card. First, I love the fact that the card is a trifold. Haven't tried one of those yet and that and the design have really inspired me. masculine cards are such a challenge for me, but this hope has really given me some great ideas, thanks! My friend just bought a motorcycle and would love this card. Great idea. Wow!! You really pulled out all the really cool ideas for this one Jill. Thanks for the chance to win. Great card. I like trifold idea and how you did it with embossing powder and the diamond plate. Really different color combination - really interesting. Love seeing the diamond plate in a different color combo too. Great group of photos showing every detail as well. Really nice & unique card Jill - TFS! Great card. I love the embossing folder you used with it. Great saying too! I love the inventive background; I never would have thought of doing that. The tri-fold card makes it special also. I love the textured background. Great card. I have used that tri-fold a lot recently...I find it a great quick card that looks much harder than it is to create. I ADORE that background! Great card! Thank you so much for sharing. The quote is great on car trips with the kids! Another great use of the tire tread! Fantastic card! I really enjoyed your unique use of the diamond plate. Thank you so much for sharing. Great guy card, Jill. Love the tri-fold design. Wonderful guy card. Really like the colors and the map and the tire tread. I love the motorcycle! I married a biker and he would love this! be very hard to obtain the preferred substance.